The GT Spec Muffler is the ultimate in high power exhaust systems. Previously available only for select GT class vehicles, we are now proud to offer the GT Muffler for a wide variety of popular vehicles. The GT System is a FULLY polished stainless steel exhaust utilizing a massive 95mm* (3.74 inches) piping diameter channeled through a 114.3mm (4.5 inch) tip. A’PEX proudly stands as one of the only manufacturers in Japan to own and operate a 95mm mandrel pipe bender. 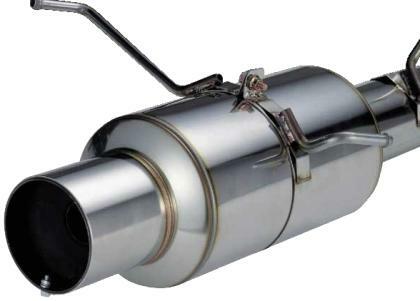 An A’PEX Silencer is included to suppress exhaust sound output for street applications. By using even lighter SUS 304 stainless steel piping to save weight, the GT Series muffler stands as the benchmark of power, craftsmanship, and design. Each muffler incorporates immaculate robotic TIG welds as well as hand crafted welding.